Fig. 2. 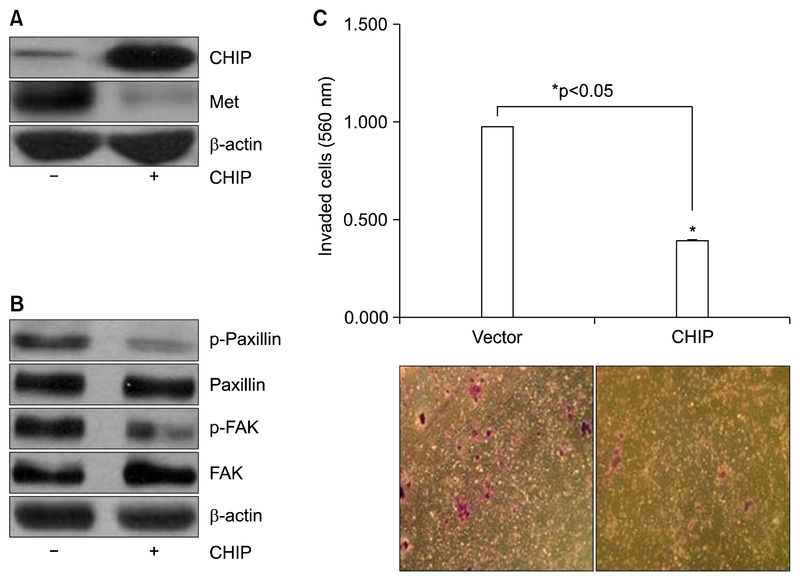 Effects of CHIP on the reduction of invasion and MET expression. (A) NCI-H69 cells were transfected with a pcDNA3 vector control (−) and pcDNA3-CHIP (+) for 48 hours and analyzed by immunoblotting using CHIP and MET antibodies. β-actin was used as a loading control. (B) NCI-H69 cell lysates were immunoblotted with anti-phospho-paxillin, anti-paxillin, phospho-FAK, and FAK antibodies. β-actin was used as a loading control. (C) CHIP-overexpressing and vector-transfected cells were evaluated for their ability to pass through membranes with 8-μm pores covered with Matrigel and gelatin (a mixture of proteins from basal membranes) to a lower chamber without fetal bovine serum. The invading cells were detected by colorimetric optical density readings at 560 nm and observed under a microscope. *p<0.05, statistically significant difference between the pcDNA3 vector-transfected and pcNDA3-CHIP-transfected cells. MET, mesenchymal-epithelial transition factor; CHIP, C-terminus of Hsp70-interacting protein; FAK, focal adhesion kinase.